Hi Folks! Sally Here from the Henry B. Plant Museum with some great arts and culture in Tampa Bay related news for you! The Henry B. 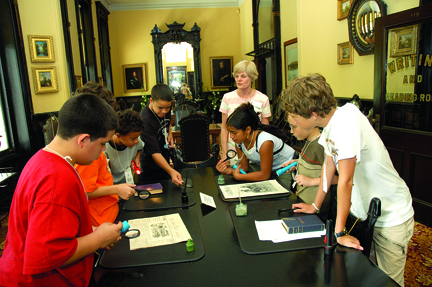 Plant Museum invites Tampa Bay teachers to visit the Museum on Saturday, May 7th from 10 am to 5 pm as we salute them during Teacher Appreciation Week. Admission is free for teachers and their families with their school ID. Teachers can explore the Museum at their leisure and enjoy refreshments on the veranda, make Field Trip reservations for 2011-2012, use a self-guided audio tour, and participate in a special tour at 1 pm given by our Curator/Registrar, Susan Carter. Teachers are eligible for prizes and giveaways. They may also view the award-winning, 14-minute historical video on “Florida’s First Magic Kingdom” and investigate our new exhibit Henry Plant: King of Florida. Henry B. Plant Museum is located next to downtown, on The University of Tampa campus at 401 W. Kennedy Boulevard. For additional information visit our website at www.plantmuseum.com or call Heather Brown, Curator of Education at (813) 258-7304 or email her at htrubee@ut.edu.